Our Five Ring Circus: They Said WHAT?!? I'm sure many of you spotted the banner above on social media today. Spread the Word to End the Word is a campaign to stop the use of the "r" word. It does take a lot to offend me, but using that word is just plain hurtful and unnecessary. The "r" word has never been used to describe Liam, but unfortunately, that will probably happen in his lifetime. When I think about it being said, it makes me sick to my stomach. I'm not quite sure what I'll do when that day comes, but I can imagine I will go into full mama bear mode! That word has been casually tossed around by people we know, and it just makes me feel uncomfortable. Why use it? There are so many other alternatives! We have spoken to Dylan and Lexie about the word and why we don't ever use it, and I know they both corrected their friends before. I don't think the majority of people realize they're using a hurtful term when they say it casually. So that's the point. Spread the word! Words can hurt. Sometimes, they're not intended to hurt, but come across as hurtful. Other times, they are spoken with one purpose: to cause pain. Shortly after having Liam, one of my blog posts was featured on a major site, and AOL featured it on their homepage. It brought out ALL the crazy people. At first, their comments hurt, but then I realized one very important thing: They don't matter. Instead of feeling hurt or angry by the words that were just meant to cause me pain, I felt sorry for the people who spoke them. I felt sorry that they had so much anger in their lives. I felt sorry that they felt the need to attack another human being that they didn't even know. I felt sorry that they had to hurt another person in order to feel better about themselves. But here's the deal. I am happy. I have love and joy in my life. I'm happy with my life. I am blessed. Their comments didn't change anything in my life. Their words? THEY DON'T MATTER. Now when I hear a hurtful comment, I deal with it calmly, and laugh about it later! *"The child isn't retarded. The parents are retarded for having a 4th child." Really? Is that the way you feel? Thanks for that. But I think you're just trying to find a creative way to hurt us by using the word retarded. *"Of course he has Down Syndrome. You are only allowed to have 2 kids per couple. Didn't you know that?" I didn't know that! Is this some new rule? Well, in that case, we have our two allotted kids, and I'll take one for my 60 year old neighbor who never had a child, and one for my sister who never had a child! THANKS! *"You know, they do have prenatal testing for that." I do know that! It might surprise you that we chose not to have in depth testing done with our children, because we knew we would have them whether they were "perfect" or not. And those screening tests? They CAN be wrong. Trust me. The chances were extremely low, and the ultrasounds were all perfect, so we were very surprised by the birth diagnosis. That being said, he is perfection to us, and we don't regret anything. *"You're done having kids, right?" Why yes, I think we are. We do have our hands full with four kids. But if space and money weren't an issue, we would add to our family, probably by adoption. That being said, I don't think this matter concerns YOU. *"Oh, I'm sorry. Was he born with the cord wrapped around his neck?" Um, no, he was born with a genetic condition. *"Did your morning sickness cause him to have Down Syndrome?" Nope. Not at all. If that was the case, all 4 of my kids would have Down Syndrome. Morning sickness is just a symptom of pregnancy. His genetic makeup was determined the moment he was conceived. *"He's so beautiful. It really is a shame that he's going to be fat someday." Why yes, he is beautiful! Thank you! 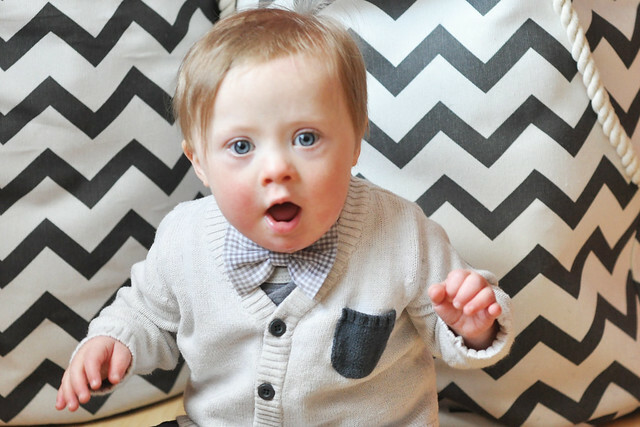 While he does have a chance of being overweight, people with Down Syndrome DO come in all shapes and sizes. Just like any other person. And thanks to routine thyroid testing, early intervention, and better healthcare, people with Down Syndrome are living healthier lifestyles than ever before! *"Are they completely sure he isn't a 'Little Person' too?" Uhhhhhhhhh...yes? I mean, he is a little person, but not in the way that you're thinking. People with Down Syndrome tend to be smaller and shorter in stature. Plus, I'm certain we would have found that out by now. *"He doesn't have the eyes." What eyes? Do you mean the two blue ones at the front of his face? Oh, THOSE eyes. His features are mild, but he does have "the eyes" that you speak of. Especially when he smiles super big. Those eyes take my breath away. *"He doesn't have Down Syndrome. I would get him retested if I were you." That comment? That one came from a mom who has a child who has Down Syndrome. She stated this after a thorough inspection. I was speechless. Truly speechless. *"I'm so sorry." For what? I'm not. He's happy, healthy, and beautiful. He's perfect just the way he is, and we love him every bit as much as we love our "typical" children. He's not a burden, and we will never feel that way about him. He's a blessing. I'm not sorry at all. My point is we all say things before we truly think about what we're saying. I'm guilty of the same thing at times. Because I had Liam, I am now better at stopping to think before I speak, so my words don't come across as hurtful. Many of the comments above weren't meant to be hurtful, but that's how they were perceived. Even though I've learned to deal with the crazy, hurtful, and not well thought out comments, I also know that something needs to be done when it comes to the "r" word. That word doesn't have a purpose anymore. It's either used as slang or used to hurt someone. 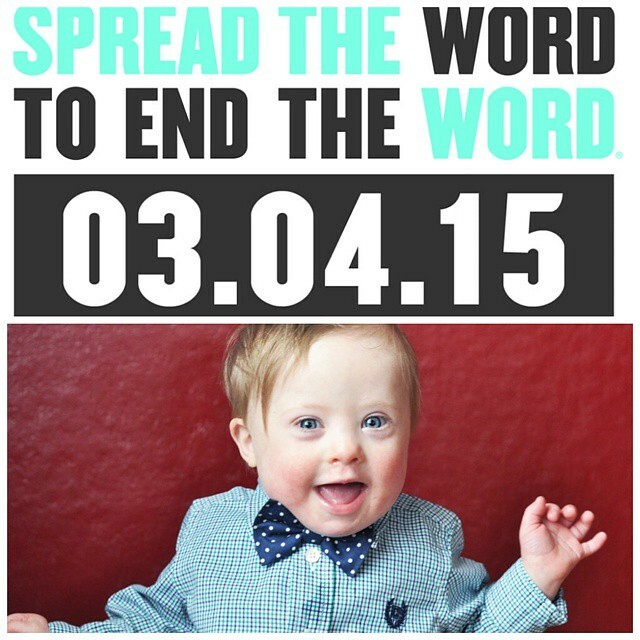 So I will spread the word to end the word. All it takes is ONE person to make a difference. Spread the word. End the word. For Liam and for every other person out there who is rocking that extra chromosome! I am quite shocked by some of the pure idiocy of those comments. I have a few people in my life who say "are you DEAF?" when someone misses a comment. Or "it's like it fell on deaf ears". Clearly not intentional to hurt, but I want to give my .02 about hearing loss whenever I hear it. He's beautiful. All of your children are beautiful. And people are mean. I, too, have four kids. My fourth came into the world after several losses and like your older son, almost came at 30 weeks. We were able to hold that off until 36 weeks. He's here, he's healthy, he's gorgeous and he's also autistic. We've heard a lot of nasty comments about having four kids, period, and during the losses, heard a lot of unsympathetic comments. I no longer get frustrated when I hear a child cry in the store and I want to help a mom who looks like she's on her last nerve, though we're all defensive now because usually the approach of a stranger is not a good thing. I'm so sorry a family member said that. I don't understand why parents don't step in! Thank you for your sweet comment. My response to the "Are they all yours?" comment is now a "Yes they are, and I love it!" People actually SAID that stuff to you? Like for real? I'd like to know who they are so I can come punch them in the face. Oh, they did! Several were through blog comments, but quite a few were in real life. I don't think those ones were intended to hurt, but I do get surprised by what people actually say! Liam's sweet little "what?" face is perfect for those crazy comments! Having 4 kiddos, I know what it's like to get those rude comments. It drives me crazy!!! I am so sorry that you all get even more and that they are directed towards Liam. That hurts my heart. You all have such a sweet, loving family. If people can't see that when they look at you all, then the problem lies within them. The comments do surprise me at times, but I try really hard not to take it personally, and react calmly! And thank you so much! I'm so glad you had four kids so you could have Liam. Such a gorgeous boy who clearly brings a lot of joy to your entire family. Thank you so much! He definitely does! You have handled some pretty ugly comments with such beauty and grace. You're a beautiful mama! I was told my daughter would have Down Syndrome and the doctors really pushed for genetic testing, an echo, genetic counseling... termination . I experienced all sorts of worry and sadness but mostly towards the thought that the ultrasound doctor mentioned termination so casually; like the little girl growing inside me wasn't good enough to be born. 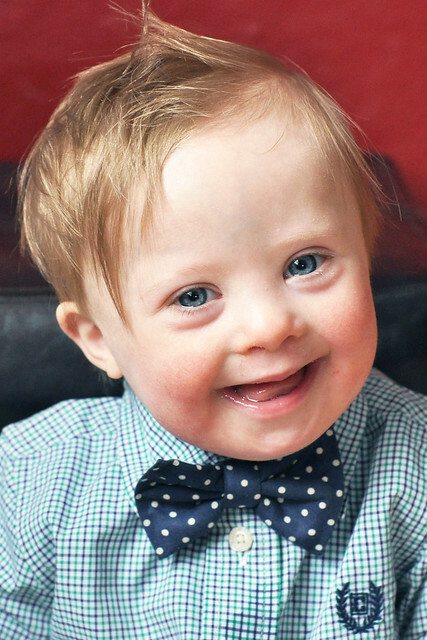 I left that hospital and went to another one where the doctor understood that a baby with Down Syndrome would be just as perfect as a baby without Down Syndrome and that termination was never an option. It's nice to read about how much Liam has been a blessing in your life, all your children are so lucky to have you.